When the wearable device is a multimedia device for watching images or listening to music, the processing unit may include an image/audio information processing unit. When the wearable device is a communication device, the processing unit may include a communication module. The patent also notes that the device might include a touchscreen rather than just a display (we’d imagine so, actually), an input-output device, and a processor. These could apply to either phone or wearable, so Samsung aren’t betting on either horse just yet – they want the ability to be able to produce bracelet versions of either device. 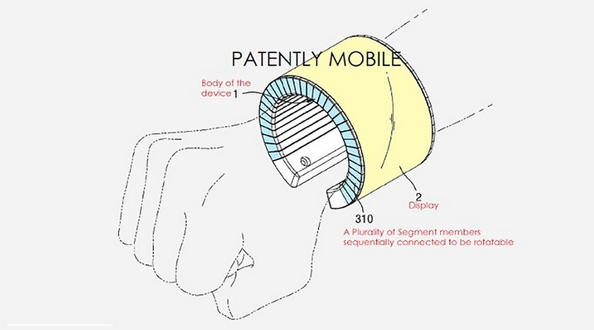 This isn’t the first time Samsung have applied for a wrist-based device patent, having filed one in 2013, after Apple did the same thing earlier that year. Tech companies file patents all the time and most of them come to nothing, so don’t get too excited yet – but we’ll be keeping our fingers crossed for the Samsung Galaxy S6 Wrist all the same. With thanks to Patently Mobile and TechRadar for the heads-up.